At Oak House No.1, your luxury hotel in the Cotswolds we offer a stay in opulent but comfortable surroundings, unique in every way and our aim is that our guests feel really welcome in a relaxed and friendly atmosphere. The Sunday Times says … “luxury hotel in the Cotswolds, Oak House No.1 has become a celebrity bolt hole” and has included us as one of their “100 ULTIMATE hotels in the UK”. Oak House No.1 has hosted many actors, rock stars and even royalty. Oak House No.1 is situated n the heart of beautiful Tetbury, voted the best market town in the Cotswolds and is perfectly placed for local events like the internationally famous Badminton Horse Trials or Polo at either Beaufort or Cirencester Park Polo Clubs. It is not uncommon to see Prince’s William and Harry at close quarters playing a match. In the winter we have Hunter wellies and thick woolly socks available in all sizes for lovely winter walks across the fields to the warm fire of a local country pub. If you wish to take a small tour in your car (one day) which takes in some lovely Cotswolds villages we have a hand written guide of the best places to go, things to see and do, good places to eat etc. As we are situated right in the heart of Tetbury there’s a choice of restaurants just a few moments from our door, but Oak House No.1 is quiet and peaceful in the corner of a fine Georgian square. The main street is full of individual boutiques interior design and many antique shops, indeed Tetbury has long been regarded as the antiques capital of the Cotswolds. All bedrooms at Oak House No.1 have been re-designed to an exceptionally high standard and feature the world’s finest quality Frette sheets, cashmere throws, free WiFi, full SKY TV package, including Sky Movies and Sky Sports Channels, a bluetooth speaker system, DVD/CD player, silver tea sets with choices of teas, coffee and hot chocolate. You can even choose the type of pillow that you prefer from the finest Siberian goose down to hypo allergenic or choose a movie to watch in your room from our DVD library in the sitting room. The Cavalier Suite has an Aquavision TV to watch while in the bath and a 46″ flat screen tv in the attached Library sitting room. Oak House No.1 delivers everything that you could want and more from a luxury Cotswolds hotel. There are tea making facilities, with a fridge with fresh milk, complimentary bottled water, soft drinks and a safe in each suite. The garden at Oak House No.1 is a quiet, cosy oasis, even though we are in the heart of Tetbury. Our aim is that the garden feels just as interesting as the interiors of the house, with different areas to relax with objects collected from as far away as Bali. For more information and photographs please select the ‘News’ heading and then scroll down and select ‘Garden’ at the top of our website. A recent feature in the Guardian newspaper goes a long way to explain why we feel Tetbury is a great place not only to visit but also to live. “What’s going for it? As a vision of Britain, Tetbury is terribly seductive. I could fall for Tetbury. We could all fall for Tetbury. A town like they used to make them. A town untroubled much by the travails of modern life, like suburbs. A town seemingly composed entirely of the kind of picturesque, biscuit/fudge-coloured Cotswold buildings you see on biscuit tins and fudge packets. A town seemingly without troublesome poor people: Tetbury has been rich since the 15th-century wool trade. A town of antiques shops, boutique B&Bs and purveyors of chutneys and biccies: with cheese shops, butchers, bakers – is that a candlestick maker? ….. Yes, that’s Prince Charles’s shop, the Highgrove deli, over there. HRH Charlie is lord of the manor, though, alas, rarely on the tills at the shop. Some say Tetbury inspired Poundbury: both seem to exist in some kind of lovely la-la land”. Remember, if you are visiting Tetbury for Prince Charles’ Highgrove House Garden Tour, we are perfectly placed just a few minutes away. The wonderful Garden tour at HRH Prince Charles’ home is available from May through to September – you can even book a “Champagne and Afternoon Tea Package” to make your visit even more special. Tetbury itself has a fine choice of restaurants and plenty of antiques shops and foodie emporiums to keep most visitors busy and all just a moments walk from our door. As Prince Charles is our near neighbour he is quite often seen here in Tetbury, sometimes driving himself (with plain clothed police nearby) and Charles and Camilla recently turned on the Tetbury Christmas lights followed by a casual walkabout through the town shaking hands with the locals and visiting the local shops. No other Cotswolds luxury hotels can provide the same level of opulence and style of Oak House No.1 making us the perfect choice to make your Highgrove visit even more special. In fact one guest commented on Trip Advisor that the real gem in the Cotswolds is not Prince Charles’s Highgrove House but Oak House No.1, high praise indeed ! Cotswolds luxury hotel, Oak House No.1 is also just a few minutes away from Westonbirt Arboretum, famed for its Autumn Colours and the biggest Japanese Maple collection in the UK. The arboretum plays host to music concerts during the summer months and recent artists have included, Catherine Jones, Paul Weller, Jesse J, Blondie, JLS, Jools Holland and in 2016 Sir Tom Jones. We have enjoyed several concerts here and must say that it’s a wonderful experience and so perfectly English ! We saw Paul Weller and others, the event was so relaxed with families having picnics and people just lazing in deckchairs in the fields enjoying the early evening summer sun, a great way to spend the evening in glorious countryside with great music. Fairford Air Tattoo is the world’s largest military air show and Oak House No.1 hotel is a great base not too far away. Remember, booking direct with us on the Oak House No.1 website you will be receiving the best possible rate compared to any other website or booking platform or just call us on 01666 505741 and we will make your reservation in a few minutes. Oak House No.1 – 100% customer satisfaction rating – a recent survey awarded us the honour of being in the top 3% of all hotels in the world for customer satisfaction. Trip Advisor Rating – We have a 100% Trip Advisor customer satisfaction rating and have been awarded a 5* ‘Certificate of Excellence’, classed as – “OUTSTANDING” for the past 7 years. This is an accolade that most luxury hotels in the Cotswolds cannot match. Hotels Combined Award -2017 ‘Recognition of Excellence’ for Oak House No.1. 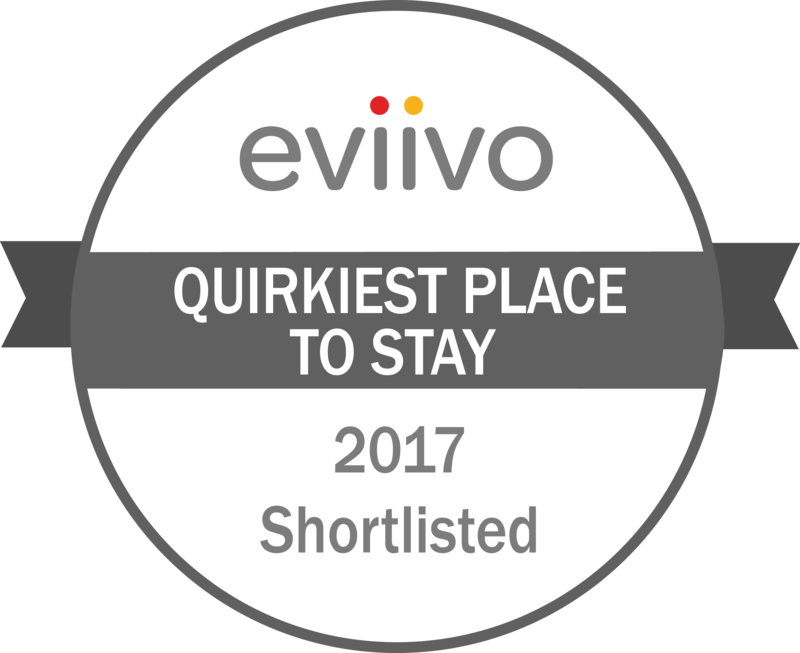 Our most recent award is a very special honour from the world’s leading unbiased hotel comparison site ‘Hotels Combined’. We are particularly pleased to receive this award from an independent and trusted platform like Hotels Combined. Other luxury Cotswolds hotels simply cannot compare to Oak House No.1’s amazing 9.9 out of 10 customer rating, we will keep on striving for that perfect 10/10. “ When Alice arrived in wonderland and Doctor Parnassus invented his imaginarium, they must have been here. Where designer opulence collides with creature comforts, where art, creativity, rock and roll and inspiration drips from the walls, where glitz and glamour meet tradition and taste. Receive the warmest of welcomes from the wildest and most wonderful couple. A stand alone experience, second to none”. Jon, Uckfield. Sunday Times ‘Travel’ List – one of the ‘ULTIMATE’ 100 hotels in the UK. £695.00 per night, including tax, breakfast - Our most luxurious Suite , for that SPECIAL occasion.